This is a different type of recipe I want to share.Its not a recipe for eating, but rather one for playing!It has been getting colder here in Utah the last couple weeks. We have had a few rainy days and even a day where it snowed. Crazy. My daughter was getting a little anxious about not being able to go outside so I pulled up a recipe I found on Pinterest for homemade playdough. It is SO EASY to make! It is just a dump and stir kind of recipe. I whipped up 4 batches in seriously no time at all! Typically, I am not a fan of playdough. The smell of it makes me sick to the stomach. This playdough however, did not smell and was so soft and squishy! By far THE BEST playdough I have ever played with. It made our rainy day turn into quite a fun afternoon at home! My daughter and I LOVED it! She had more fun squishing it and pulling it apart. I on the other hand, felt like a kid again molding fun creations! I would make things and have her guess what it was. She got a kick out of it!I have A LOT of plastic baby food containers on hand, and How Does She? 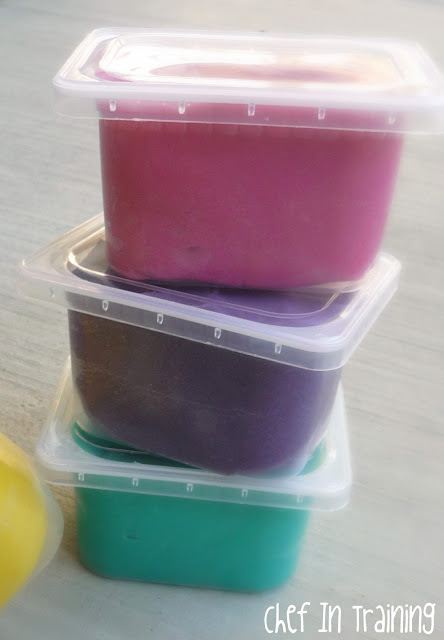 suggested the fabulous idea of putting the playdough in those containers and giving them as gifts or even STOCKING STUFFERS! Wouldn’t this be such a fun stocking stuffer for kids? recipe from: How Does She? Dump all the ingredients into a pot and stir them until blended together. Cook over medium heat, stirring constantly, until it forms a large ball. As soon as it joins into one large ball, take it off the heat and dump it onto your counter or wax paper. Wait for it to cool, then knead it a few times until it becomes nice and soft. Hi, I'm Nicole from Romanian Princess. I love your blog, and I'm your newest follower, please stop by my blog and if you like it, PLEASE follow me back! Thanks for sharing, I'm going to try that! I like that the ingredients are edible just incase he sneaks some in his mouth! the powdered Cool-aid is also good to color the playdough. That was the only thing we used Cool-aid for in my house that I can remember. Tends to be cheaper than food coloring too. 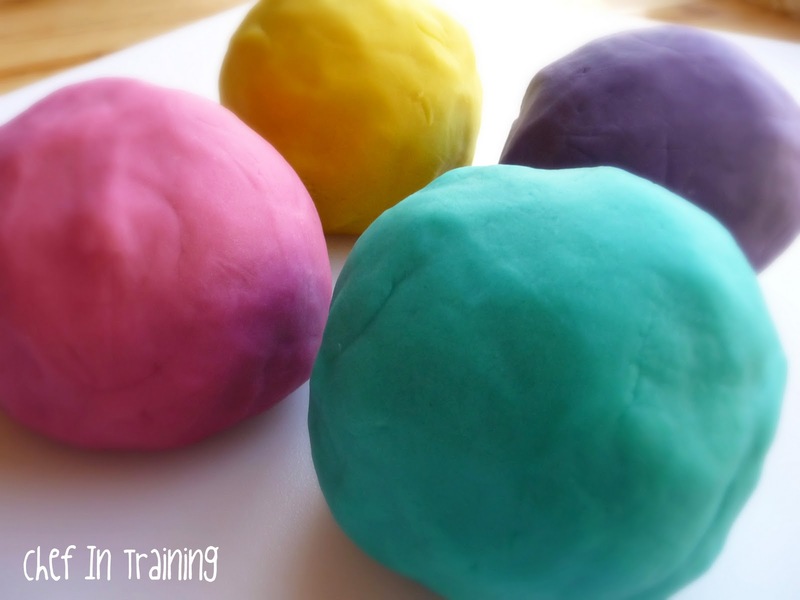 My family always made homemade playdough! We would use a packet of Kool-Aid not only for color, but for smell. MMM it smelled so good! that stuff was my favorite growing up! Cute idea! Love the colors! Looks like it made for a fun day and many more to come! 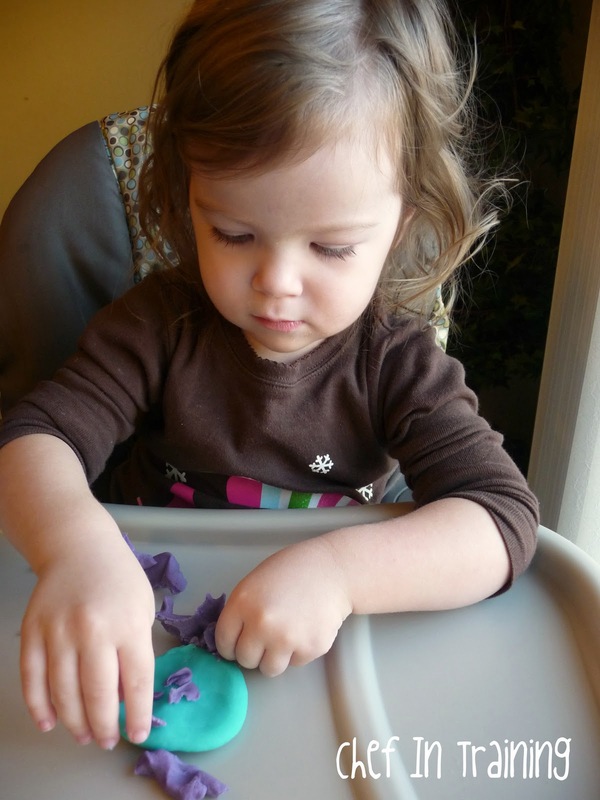 I think every kid loves playdoh! So much cheaper to make your own and I hate the smell too! Fun colors! I'm going to have to try this for my daughters. Love the colors! Very cool! 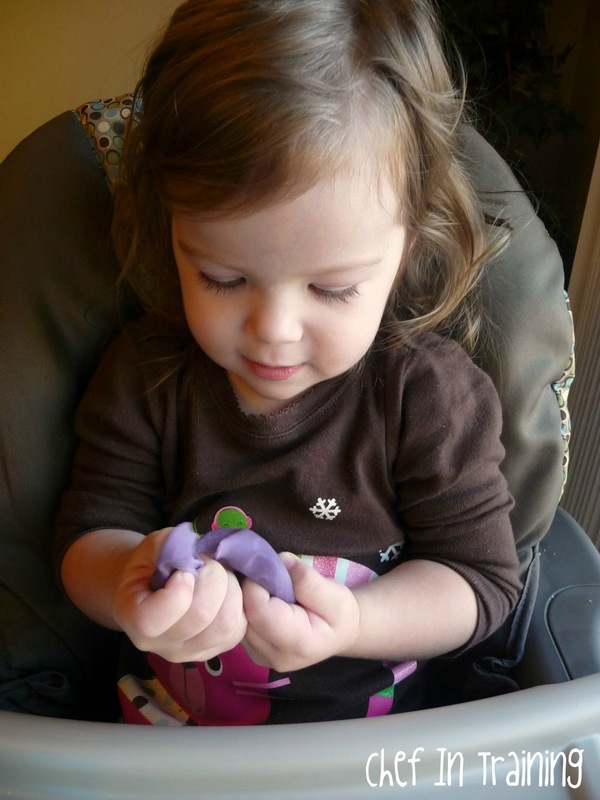 My girl has recently discovered the wonders of play-doh. We'll definitely have to give this a try! Anna-Leigh try Kool-Aid for better color its cheaper and smells so good. These playdough look so good! I love the deep red velvet color...they would be perfect for Christmastime. I make a batch of homemade play-doh as my 3 year old turns it into brown-black muddled color and whines it's not pretty anymore pretty quickly! I've found that the Kool-aid is a semi-fail as a colorant--especially generic kool-aid, unless you want lots of red, since many of the flavors are colored red. I make a large batch and separate it into balls and knead in the coloring instead of making each color separate. I knead in food dye and add the white powdered Kool-aid (or generic) for the scent. Though better than that odd real Play-doh smell, salty-flour isn't much better! Thanks for this great "recipe" I just made some red play-doh with it and it's cooling right now. I love the softness of it ! I'll definitely do other colours for my 18 months to play with ! If you want to really make it smell great, instead of food coloring use 1-2 packets of kool-aid. Not as many color choices bu smells really great!! I double the recipe, add the oil,(sometimes a bit more) hot water and food coloring together; that way you can make it on the table with the kids!Store in tupper ware. Thanks! I'm so excited to make this with my son. I have no cream of tartar on hand though. Any suggestions? I just made 3 batches and it turned out great!!! My 2 year old is already playing with it. Thanks!! Can you put a finished creation in the over and bake it for a little bit to preserve the kids' creations?? I love this recipe. Lasts for days and very workable. The only tip would be that jell colors are better in this recipe because they won't make the playdough sticky. I had to add a little more flour to mine at the end. Other wise this my playdough recipe forever. Such a great recipe. Then consistency was PERFECT. My kids loved it and it lasted for at least 2 weeks. Making it again today. Thanks for this great recipe. Now I can have playdough for the kids whenever they need it and they stay creatively busy while I do my work. Hello, thank you the recipe. But can i make it without cream of tartar? What can i use instead of cream of tartar? Can you reply me to my email. That would be very helpful. How important is cream of tarter? I added raspberry extract to make it not smell better so that's an idea instead of kool-aid!